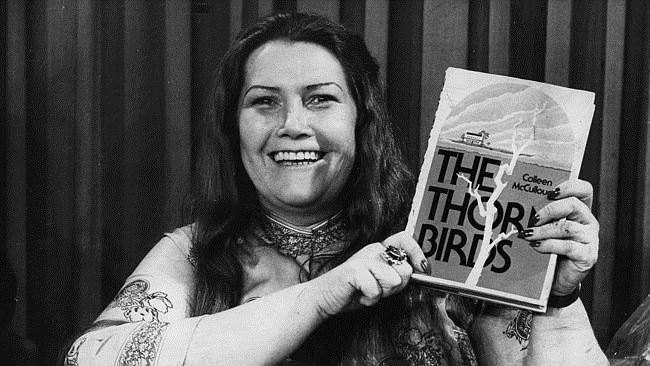 Colleen McCullough was a great storyteller and a great lady. I discovered that when I first met her on Norfolk Island in 1993, producing a story for the Nine Network’s Sunday Program, with reporter Max Cullen. I was looking forward to the trip after getting a call from a Random House publicist, Alan Davidson, asking if we wanted to do a profile of the famous author to help promote the third book of her seven-part Masters of Rome series, Fortune’s Favourites. Her Roman novels had Julius Caesar at their heart, and the history of the Roman Republic as their backbone. McCullough built up a virtual library on the Republic, hiring researchers to help her gather the massive volumes of historical material used in the novels. She loved research from her days as a neurophysiologist at Sydney’s Royal North Shore Hospital, the Hospital for Sick Children in London, and as a neurophysiological research assistant at the Yale School of Medicine in the US so it was important for me to reciprocate before flying into Norfolk Island with the crew. I talked to Warren McStoker, a legendary producer at Nine’s Sixty Minutes, who had done a story on Colleen and became a friend. He advised me to do as much reconnaissance as possible: Colleen does not suffer fools gladly. Another friend of the author, Bernie Leo, then the chief sub-editor of the Australian Financial Review, gave me two valuable bits of information: she and her husband Ric Robinson loved to play scrabble (Bernie used to join in the game on visits); and she liked Madura Tea, cultivated in the Tweed Valley in northern New South Wales and virtually impossible to get on Norfolk Island. Despite that, we were well prepared, I thought. As my usual Sunday reporter that year, the late Paul Lockyer, often said: “Time spent on recce (reconnaissance) is time well spent.” Alas, don’t miss the obvious. For television stories, you try to shoot a lot of vision of the main talent to give the editor overlay for the interviews, narrative and thought track (that’s when the person being profiled looks out over the sea, or garden, or the landscape and his or her voice runs underneath). I sat down with Colleen and Max and the cameraman, Jim Chrystal, and the sound recordist, Nick Nezval, to talk about the shoot, and she had a lot of questions. After all, she had been a successful and world famous author since the US paperback rights for The Thorn Birds went for $1.9 million in 1977. She knew a lot about television interviews. I did my best to answer them all, but I felt I wasn’t exactly scoring goals. Where was Warren McStoker when you needed him? I pressed on and said: “Could we get started with a walk through your wonderful garden?” It was beautiful, with a rolling hill, and quite expansive. And that was my first mistake. As Max and Colleen wandered lonely as a cloud (with apologies to Wordsworth) before coming to a host of Norfolk pines and palm trees, I could tell she was getting a bit tired, but we needed that vision. What I didn’t consider was that Colleen had recently been diagnosed with diabetes and her feet were hurting. I didn’t learn this until her personal assistant mentioned it the next morning. No more walkies for Colleen McCullough! As you’ll be able to see in the edited video accompanying this post, Colleen had a large and lovely library with a lot of reference books and novels. She told Max: “I’m not a great reader of novels, but I like to have them.” She shared her love of libraries, talking about the stacks of books at Yale University, while I waxed lyrical about the libraries at Villanova and New York Universities, and, of course, Sydney University. When Max Cullen asked Colleen how she replied to her critics, she said: “I don’t. Like Liberace I cry all the way to the bank.” And she broke out in that glorious laugh of hers. She liked the Thorn Birds book, of course, but not the mini-series, one of the most watched television shows of all time. She told People magazine in 2000: “I hated it. It was instant vomit.” At one point in the interview, she told Max that Tim (her first novel) was made into “a very nice film,” but as for The Thorn Birds series: “I don’t want to talk about it. I want to heave.” It usually prompted those stomach-churning synonyms. But Colleen McCullough had only kind words about fellow novelist, the Nobel Prize-winning Patrick White: “I love Patrick White. And I tell you, the death in the garden in The Tree of Man. If I could write a page or two like that, I’d be happy. I never will.” So there is a humble Colleen McCullough. Just before we left, Colleen signed some of her books for my mother, who lived in Philadelphia and was a big fan of her work. My mother passed away a few years later, but she was so excited when I gave her the signed copies after the shoot. And despite my getting Colleen to work like a Roman pleb, a forgiving author could not have been more hospitable. She then signed a copy of Fortune’s Favourites for my wife and me, “with many thanks.” No, Colleen, you deserve all the thanks … and kudos. And for the shortened 12-minute video version of the Colleen McCullough story, please click below. My thanks to Channel Nine for allowing me to post this on my blog, to Richard at TCN Archives for all his help, to Mike Connerty, who edited the original Sunday story with his usual creative genius and to Steve McQueen, who cut down the story with his usual professional expertise. Photo at the top by Ulf Andersen/Getty Images; Photo of Colleen with Thorn Birds book News Corp Australia.